Expert VHDL Verification is a 3 days course as part of the intensive 5-day Expert VHDL class. 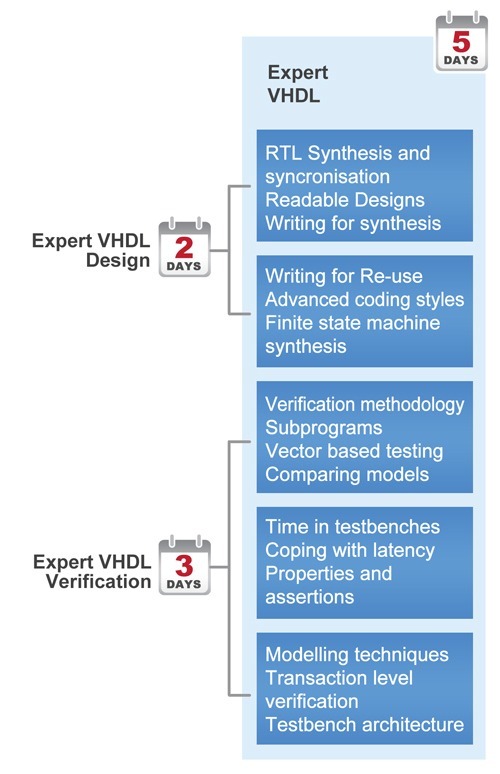 Expert VHDL Verification (3 days) is for design engineers and verification engineers involved in VHDL test bench development or behavioural modelling for the purpose of functional verification. This is an advanced language and methodology training class. Prior attendance of the Doulos Comprehensive VHDL class (or equivalent) is required, and at least 6 months of ‘live’ project experience using VHDL is strongly recommended. Delegates attending the Expert Design Verification module must have knowledge and experience of register transfer level coding and synthesis using VHDL.